This year marks the 60th anniversary of the Lao People’s Revolutionary Party (formerly known as Lao People’s Party), which was founded together with the Indochina Communist Party to expel foreign invaders from Laos, Cambodia, and Vietnam. The struggle for independence finally succeeded in 1975, which led to the establishment of the Lao People’s Democratic Republic. Photo Credit: The Diplomat and Abhisit Vejjajiva. 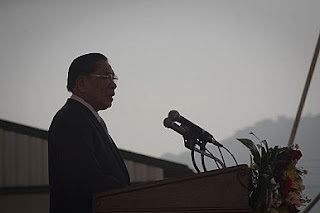 To celebrate the party’s achievements in the past 60 years, a large gathering of senior party leaders and high-ranking party officials was held at which party secretary-general and president of the Lao PDR Choummaly Sayasone delivered the keynote address. Choummaly praised the “people’s fighting movement” in leading the Lao multiethnic people during the two-decade campaign for national liberation. He also defined the major victories of the party after 1975: “We were able to heal the wounds of war, restore production, promote culture, and normalize the living conditions” in the country. A “state-managed market-orientated economy” sounds like an oxymoron but Choummaly repeated it several times in his speech to emphasize that the party has “liberalized old ways of thinking towards a realistic analysis of the [global] situation” while pursuing socialist directives. But despite Choummaly’s claim that Lao socialism has led to the empowerment of the people, his speech provided several confirmations about the high poverty rate in the country. For example, he pushed for higher productivity to end poverty in all sectors. “We have to concentrate on alleviating the poverty of local people and graduating from least developed country status and creating a fundamental foundation for our country to move towards socialism,” he said.